Happy New Year! Thanks to the way Boxing Day fell this year, there was no The Beauty of Transport last week. So, a week later than usual (it’s a Christmas AND New Year Special y’all!) here is a seasonal special from the wilder frontiers of transport’s impact on culture. A couple of years ago I told you the story of how a Sindy doll accidentally introduced me to one of the most stylish transport corporate identities of all time, that of the British Overseas Airways Corporation (BOAC) (The Beauty of Transport 13 April 2016). At the time, I couldn’t source the picture for reuse, but here she is now in all her 1960s glory. For overseas readers unfamiliar with Sindy, it basically went like this: Sindy was a fashion doll with a range of lifestyle accessories, produced by British firm Pedigree. Although still available today, the golden age of Sindy is generally reckoned to have run from her introduction in 1963 until 1987, when Sindy was acquired from Pedigree by American toy company Hasbro and rapidly remodelled to look much more like the American Barbie doll, produced by Hasbro’s great rival Mattell. In my family, while Barbie was emphatically not to be approved of, the rather more wholesome-seeming (and certainly less pneumatic of physique) Sindy got the parental thumbs-up, and my sister had a large collection. Particular favourites of mine included Sindy’s television studio, and Space Fantasy Sindy (both released in 1985). The latter had a silver tunic and pink hair; having something about her of Moonbase’s Lt Gay Ellis from Gerry Anderson’s TV series UFO, and hence being considerably more interesting to me than the average Sindy doll. In contrast to the American concerns of Barbie, Sindy’s interests as reflected in her clothes and accessories seemed rather more British in outlook. This extended to her transport interests too. Looking at it now, I am startled to realise that the world of Sindy gives you a very good idea about what 1960s and 70s Britain thought represented desirable transport options. But then again, why should I be surprised? As a fashion doll, she was simply reflecting what was fashionable. A job as a BOAC stewardess was perhaps one of the most glamorous British transport jobs to which Sindy would have been able to aspire in 1966, when that Sindy was released. She certainly wasn’t going to be flying the plane, after all. But her smart uniform and bag are as fabulous today as they were then, just with added nostalgia for a lost world in which air travel was the height of sophistication. Though BOAC was ushering in the jet age which would eventually transform the way the British took their holidays forever, the process was in its infancy. For most British people a holiday on distant sunny shores reached by aircraft was still a dream. Holidays at home were by far more common. Sindy was no different. She might have had a job at BOAC (one of her many), but she was just as much at home in that classic British holiday location of the 1960s and 70s, a caravan. My sister had a Sindy caravan too. Released in 1978 and constructed from wood and hardboard, the entire roof of Sindy’s caravan was removable to reveal the interior. Endless drizzle and a soggy field in Wales in which to park the caravan, which might arguably have made Sindy’s caravan a truer reflection of the British holiday experience, were not included. I was never entirely clear how Sindy’s caravan was supposed to be towed. In my house, it was teamed, not entirely practically, with Sindy’s buggy. Released in 1975 (a bit like me), this yellow off-roader seemed unusually American in outlook for Sindy, whose other interests included cooking, cleaning (she had a bewildering array of cleaning appliances), ballet, keeping fit and dressage-type horse riding, to judge by many of her outfits anyway. The buggy surely reflected the increasing popularity of American (and particularly Californian) culture in Britain with imported images of surfing (remember the Old Spice adverts?) and beach buggies. An earlier 1973 jeep-style car might have also have done the job of towing the caravan but looked unusually utilitarian for Sindy’s normally stylish lifestyle; it had its origins in a military jeep toy designed for a different toy line altogether. Much later, she gained one of those bastions of the British country set: a Range Rover, rather more useful for towing the caravan and her various horse boxes than either the jeep or the buggy. When not needing to tow trailing vehicles, Sindy maintained her reliable eye for picking the style highlights of British transport. She owned this quite spectacular red MGB, released in 1965, demonstrating what enviably good taste she had. There are plenty of us around who’d like an MG like that even today, a high point in British sports car manufacturing. Sindy’s head could be turned by gentle commercial persuasion. 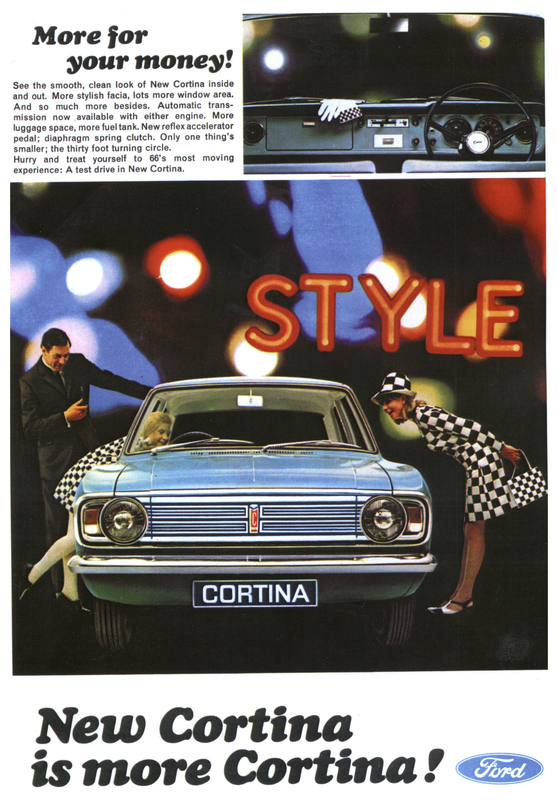 She might have had her red MG, but in 1966 Sindy gained her “Miss Cortina” outfit, to tie in with the promotion of the Ford Cortina MkII, with an outfit which matched that of the new Cortina’s advertising literature. She can be seen below, with an example of the advertising poster via this link. For a while, Sindy had a boyfriend called Paul. He could also be found showing off the best in swinging sixties transport with the fabulous “Paul’s Scooter”, perfect for dashing about town and country (according to the box) and reflecting the ‘Mod’ culture that glamourised such transport. Released in 1967, Sindy was later to strike a blow for female equality when Paul was dropped from the Sindy range, and the scooter was rebranded “Sindy’s Scooter”. Before his untimely departure though, he could be found being “Motorway Man” in 1965, complete with that then-car travel essential, a Thermos flask. Back in 1965, Britain’s new motorways were regarded as modern wonders, the white heat of the technological revolution in highway form, epitomised by the cutting edge architecture of structures like Forton Services (The Beauty of Transport 3 June 2015) and here in their inclusion as part of the world of a fashion doll. Just as much as those Sindy dabbled in, the transport modes she didn’t are equally reflective of the views of the society for which she was made. There was no Sindy bus, nor bus driver/conductor outfit. Neither was there a British Rail Sindy. Picture that, if you will; a caravan being considered worthy of inclusion in Sindy’s world but buses and trains being excluded as too unfashionable. Glamorous transport was jet aircraft, motorways and cars. Sindy was, after all, truly a woman of her times. An absolute joy! Thank you. Oh wow! My 60s childhood revisited! My older sister had Sindy, but basic format. Can’t remember she had the car or anything like that, I think it was just the clothes. Then again, I wouldn’t have cared much… I was panting for Action Man. Santa failed to deliver, unfortunately. Touching Miss Sindy or any of her accessories was, however, usually followed by a good thump… my sister was 3 years older and a lot stronger! Those 60s travel bags have become retro-fashionable, as I’ve seen with hipsters. We had the originals. One of my best friends’ fathers was a travel agent, and my mate had a BEA one, which he used as a school bag, circa 1968. The rest of us were awed – we still had those satchels with the straps you were supposed to put on your back. We never did. A beautiful read. Thank you! Thanks for sharing this blog post! I regularly travel for business and enjoy reading posts about airlines. It’s interesting to find out that the Cindy Doll was once used to promote BOAC in the 1960’s! Willow at GSE Solutions. I hope everything’s OK at Beauty of Transport Towers, really missing your writing! Thank you – everything is fine! It’s just that I’ve been busy with the paying work, such that the unpaid work (a.k.a. The Beauty of Transport) has had to take a back seat. There are more articles on the slate; I just need to find the time to write them.